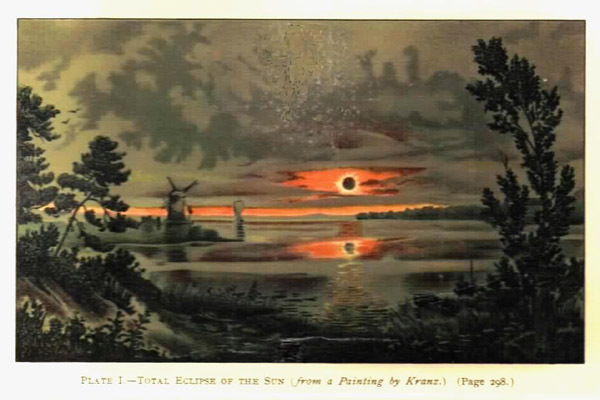 A sketch of the total éclipse in Australia, 1km north of Palm River. Perfect observing, with L80x40 majority time and 15 seconds fabulous in T400-c x 80, realy fantastic! my finest minutes as an amateurastronomer! The eclipse started with a long lasting diamondring, and ended > with a shorter one. 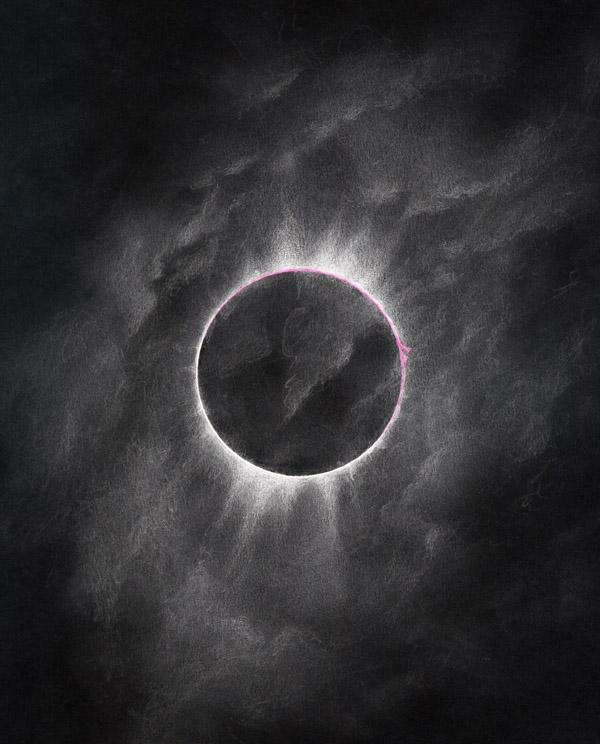 Serge Vieillard made this sketch of the total solar eclipse of 2008 from the Gobi Desert in China. In the minutes leading up to totality, clouds threatened to hide the event from his eyes. He raced 1000 meters from his initial location to find a clear spot, only to have the clouds drift there as well. In the final moments however, the clouds broke and he was able to spend an ecstatic 2 minutes drawing the view through his Kowa TSN-2 77 mm spotting scope at 20X. 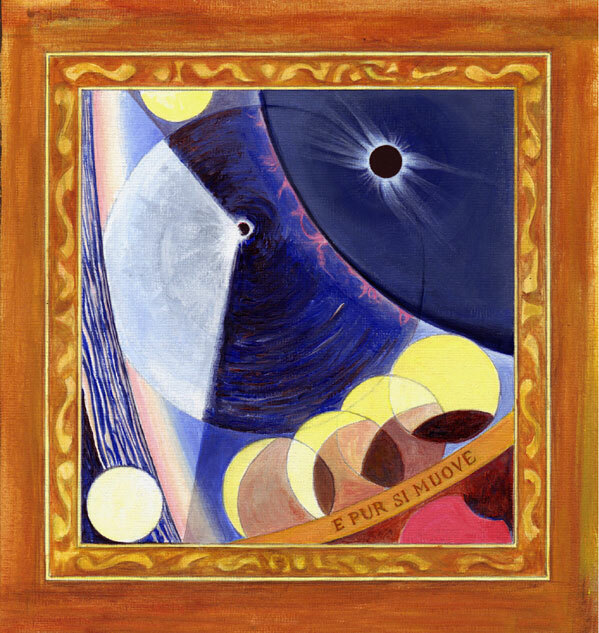 As the seconds passed and his eyes adapted, he crafted the increasingly complex, asymmetrical contours of the Solar corona and noted a bright star in Cancer. During the final few seconds of totality, the pink bloom of a prominence emerged and topped off an exciting and memorable observation. That was so great event! I do not know what was more exiting in this solar eclipse – just one hour clear sky over Novosibirsk or magic view of black sun in shining coronary ring. Whole day before this short eclipse were partial or continuous clouds, but no one after the first contact! 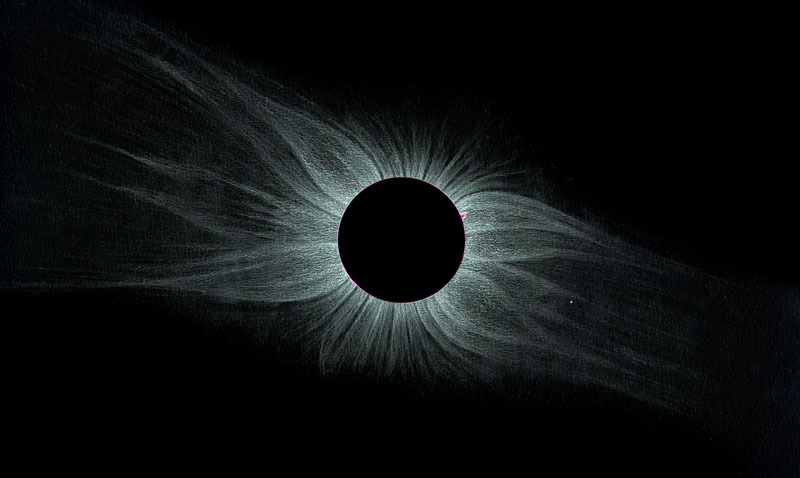 In comparison to eclipse 29 april 2006 corona was not so bright and contrast. Draft of the sketch (pencil on white paper) was made in few minutes after end of the total phase. Then in 12 hours it was made final version of the sketch (the same pencil, but with better quality). 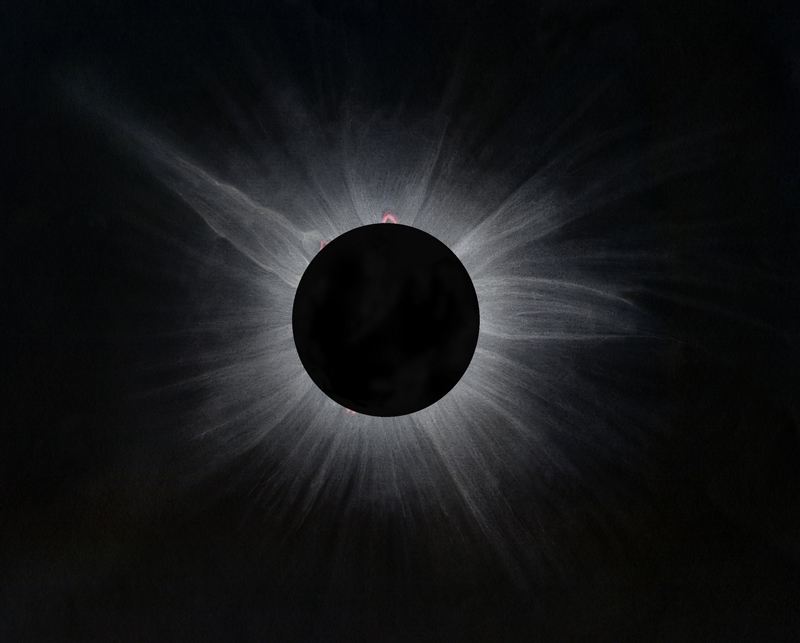 If you were about to experience the brief but awesome spectacle of a solar eclipse, would you take the time to immerse yourself in a sketch of the event? 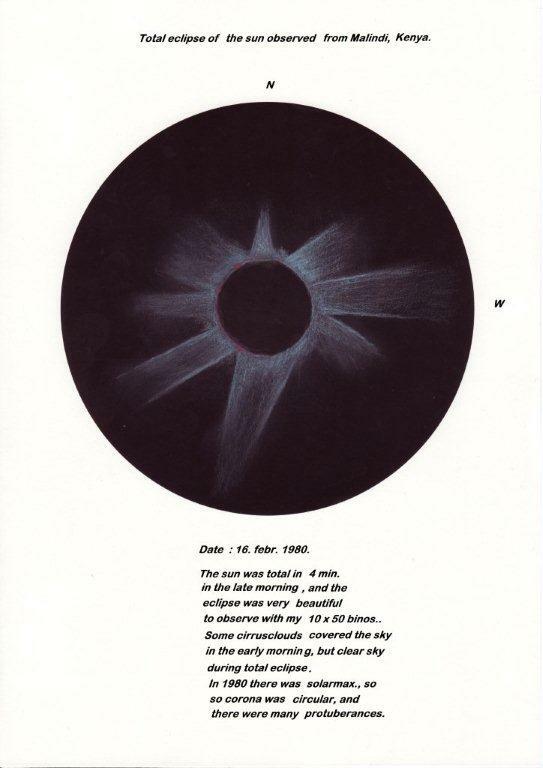 If you have a passion for sketching astronomical objects and events, you may find yourself attempting what Serge Vieillard did. On March 29, 2006, Serge and 14 other club members journeyed to the Sahara Desert in Libya to view the eclipse. Racing across the dusty landscape in 4x4s to arrive at the site on time, they set up to the southeast of the volcano, Waw Enamous. As the eclipsed deepened, they found themselves entranced by an indescribable atmosphere: the sky darkened, Venus appeared, shadows began to shift, Bailley’s Beads began to sparkle, leading finally to totality. 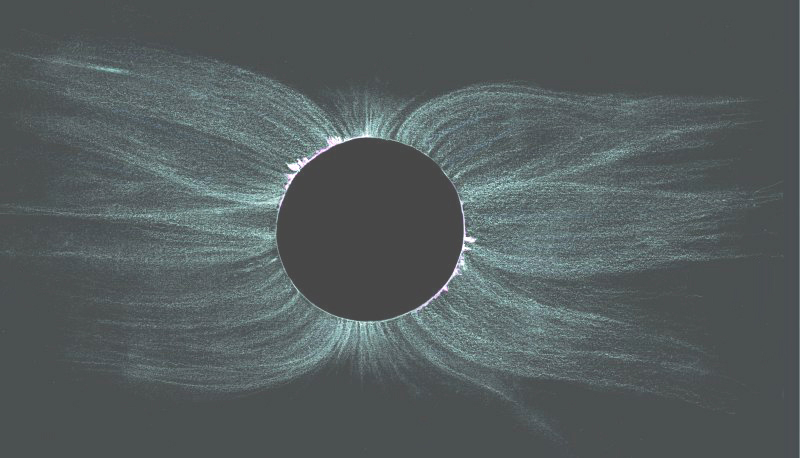 With that, the immense corona blossomed before them while solar prominences emerged and evolved as the moon passed before them. Rather than photograph this awe inspiring event, Serge chose to harken back to an earlier era of astronomy and he sketched it instead. Because totality would only last 4 minutes, he had to be fast and deliberate in his sketching method, observing with a Kowa 77 mm TSN-2 for wide views of the corona, and a Meade ETX-90 at 100X for viewing the prominences. During those brief 4 minutes, Serge sketched the main contours of the corona, and sketched in the positions of the dancing prominences. Immediately after totality broke, he spent the next several minutes finishing the details of the sketch while it was still fresh in his mind. Serge used colored pencils to add color to the sketch. However, since he was drawing on white paper and would be inverting it after scanning, he used a technique adapted from his previous color observations and sketches of M42, the Great Orion Nebula. By pre-testing, scanning, and inverting the color values of several pencils, he was able to determine what colors would produce the best color once the sketch was inverted after scanning. The results speak for themselves in this outstanding illustration. The entry from Serge’s website is included below in the original French. (Google Language Tools may be helpful in translating if you do not read French.) 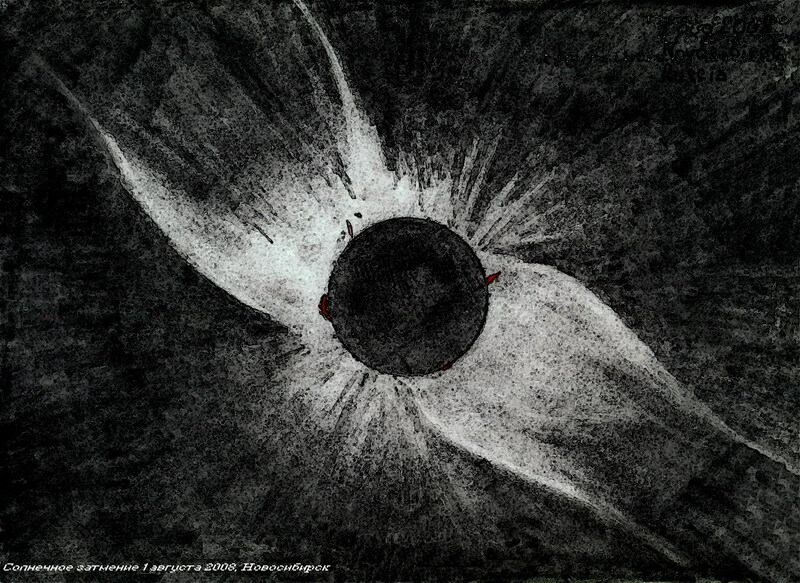 More of Serge’s incredible sketches can be found at his website: ASTRONOMIE AMATEUR OBSERVATION VISUELLE CROQUIS ASTRO. was our first eclipse. It was an overwhelming and unforgettable experience. and the corona immediately after the start of totality. on a turning Earth with the Moon and Sun shifting and moving in the heavens.